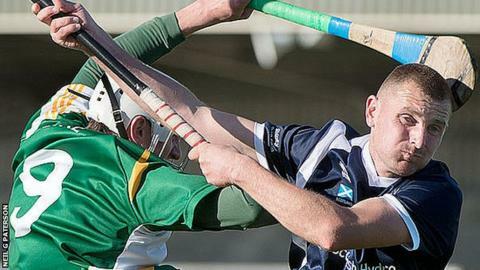 Scotland suffered a heavy defeat in the second leg of the annual shinty-hurling international against Ireland. the Scots went down 8 (11) - 4 (3) in the second leg in Ennis. Shane Dooley scored three to complement a double from Brendan Murtagh and strikes from Patrick Maher, Barry McFall and Seamus Callanan as the Irish ran out comfortable victors. Scotland's scorers were Finlay and Keith MacRae and Kevin Bartlett twice. The hosts were without Patrick Horgan, who scored a hat-trick in their victory last week, who was replaced by Callanan. Both sides traded early points with Bernard Rochford in the Irish goal the busier of the two keepers. However, it was the Irish who got the opening goal, Maher brushing the Scottish defence aside and firing home. The hosts moved further ahead when Dooley swept home within 10 minutes. Scotland looked in danger of a heavy defeat when Murtagh hammered home two minutes later. They were unlucky not to pull a goal back shortly after, Rochford stopping the ball on the line. A free-hit brought the next goal, Dooley smashing the ball home to put the home side four goals ahead with under twenty minutes played. The Irish had five shortly after, as an error from John Barr presented Dooley with an opportunity, which he converted to complete his hat-trick. Some desperate defending prevented Scotland from cutting the deficit with John Stewart denied from just in front of goal. With four minutes to go in the first half the Scots did get a goal, MacRae smashing home a free-hit. The Irish tacked on three more points before the half drew to a close and led 31 points to 7 at half-time. McFall scored at the start of the second hald, slicing through the Scottish defence to finish. Kevin Bartlett pulled another goal back for Scotland, driving the ball high in to the net from a narrow angle after 50 minutes. Murtagh added his second of the match to re-assert the home side's dominance, running away from the Scots' defence and stroking the ball home. Bartlett netted his second of the match as Scotland strived for some respectability, but shortly after Callanan scored again for Ireland with the Scottish defence posted missing. Keith MacRae gave the travelling fans another goal to cheer in the dying seconds, but Ireland won comfortably 6-2 on aggregate.